Printing documents seems to be old-fashioned in the modern era of digital communication. But there are some cases where an occasional print out of documents is necessary. I use it for example when I have to look on two or more documents to compare the contents which is pretty uncomfortable on an iPad because of the just-one-window-display. My articles ‘Air Mail by …’ explain the different possibilities to print from an iPad or an iPhone as there are Apple AirPrint, Google Cloud Print, HP ePrint. 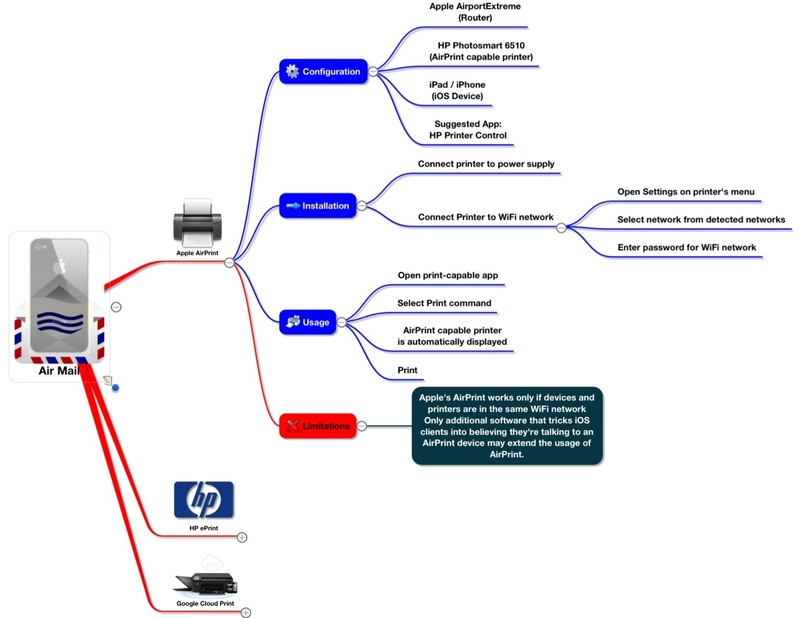 Here is a brief overview of the topics discussed in my series ‘Air Mail by…’ with details about Apple’s AirPrint. Apple is known for highly simple and user-friendly solutions. So let’s start this series of articles with the AirPrint technology developed by Apple and HP. AirPrint is a feature which is implemented in Apple products starting with OS X Lion and iOS 4.2 in November 2010, for printing using a wireless LAN, either directly to any AirPrint compatible printers (such as HP’s entire ePrint range, Brother, Canon, Dell, Epson, Gestetner, Hewlett-Packard, Infotec , Lanier, Lenovo, Lexmark, Ricoh, Samsung, Savin, Xerox and more) or to non-compatible printers through a MS Windows, Apple Mac OS X, or GNU/Linux PC. AirPrint does not require printer-specific drivers. 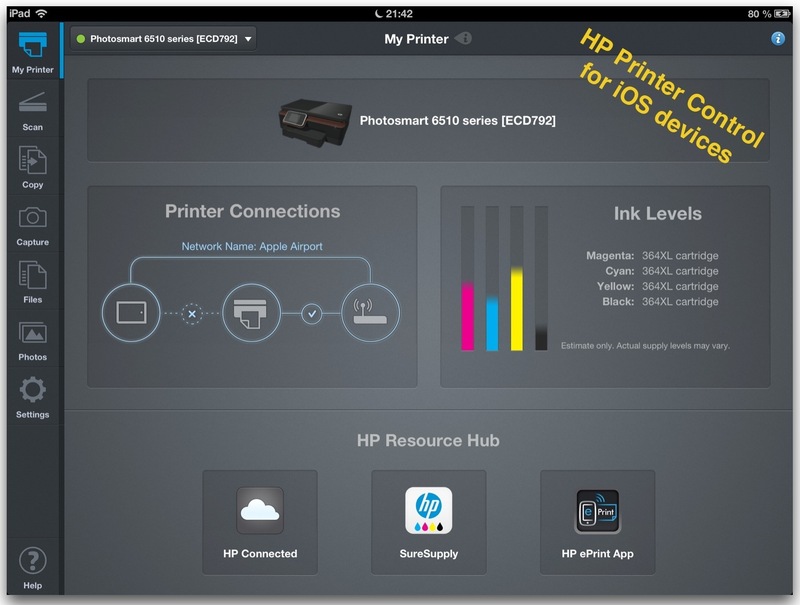 A number of software solutions allow for non AirPrint printers to be used with iOS devices. For such printers, AirPrint support can be achieved by configuring such support on an intermediary system already having such printers configured for local printing, shared on the same network. Since AirPrint is driverless, such a configuration compensates for the lack of native AirPrint support by using the drivers on the intermediary system instead. The simplest solution for all platforms is to create a new Bonjour service that tricks iOS clients into believing they’re talking to an AirPrint device. Fingerprint by Collobos Software Inc. is an example for such a desktop application which allows printing from iOS devices to every printer connected to the same network. My home configuration consists of an Apple Airport Extreme Router and an HP Photosmart 6510 which is AirPrint capable. That means the printer has just to be connected to the power supply. In a further step the connection to the WiFi network is established via the iPhone-like control panel by entering the networks password. After connecting the printer to the WiFi network the printer appears in the print menu of every printing-capable app. HP offers an app called HP Printer Control which allows to fully control the printer and it’s features like scan, copy, capture, file management and some utilities. The file management feature additionally supports access to well-known cloud providers like Box, Dropbox, GoogleDrive, or cloud providers supporting WebDAV connections. The latest version of this app has a perfect UI and is near to apps for file management like Documents by Readdle. Seamlessly move between paper and cloud-based files with intelligent mobile scanning and easy control of your HPe-AII-in-One from your iPhone or iPad. Create high-quality documents from the camera-enabled intelligent mobile scanning feature or send scans directly to your mobile device from your HP e-AII-in-One. Then print or share your device or Cloud-based files online or by E-Mail. Intelligent mobile scanner technology automatically processes images taken by your [Phone or iPad’s camera to create high-quality documents. 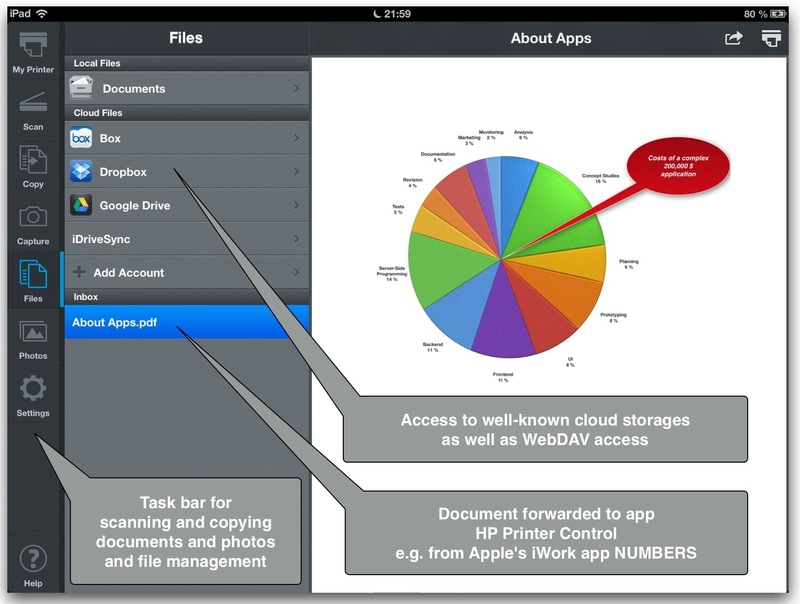 Documents can be saved as PDF or JPEG to share, store or print from your device. Access cloud document storage services such as iCloud, Box, Dropbox, Evernote and Google Drive or social media site including Facebook. Use your mobile device’s large screen to control scan, copy and print functions of your HP e-AII-inOne. Print photos, PDF, web pages, email attachments, Microsoft Office documents and more from virtually anywhere. 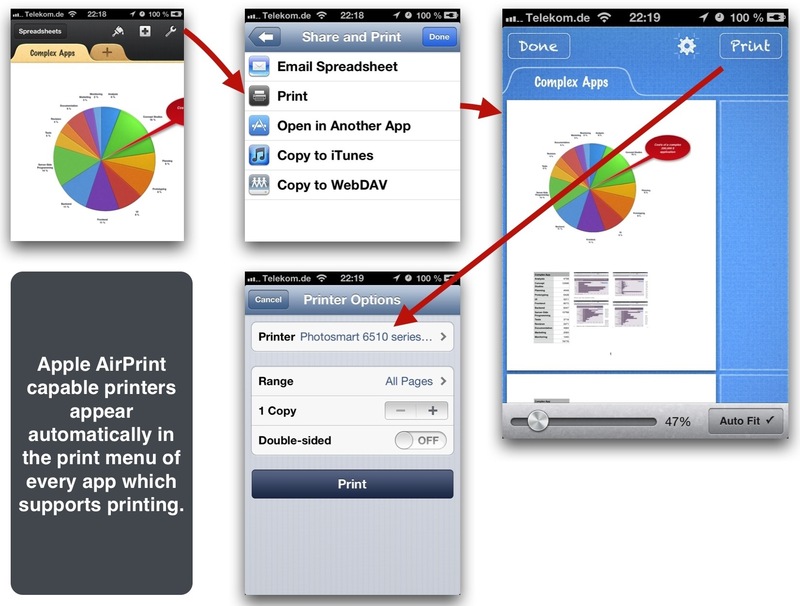 Print, copy and scan with Apple iPad, iPhone and iPad. Mobile scanning feature supported by iPhone 4, 4S, 5, the new iPad and iPod 5G (iOS 5.0 or later) or later with 5 megapixels or more camera with autofocus. Download a document from the cloud and print. Even if you are in another WiFi network or just 3G connected you can send the print job to your own printer by using your printer E-Mail address. Use ‘Open in’ e.g. from within Apple’s spreadsheet app Numbers and select Printer Control from the apps menu to print. 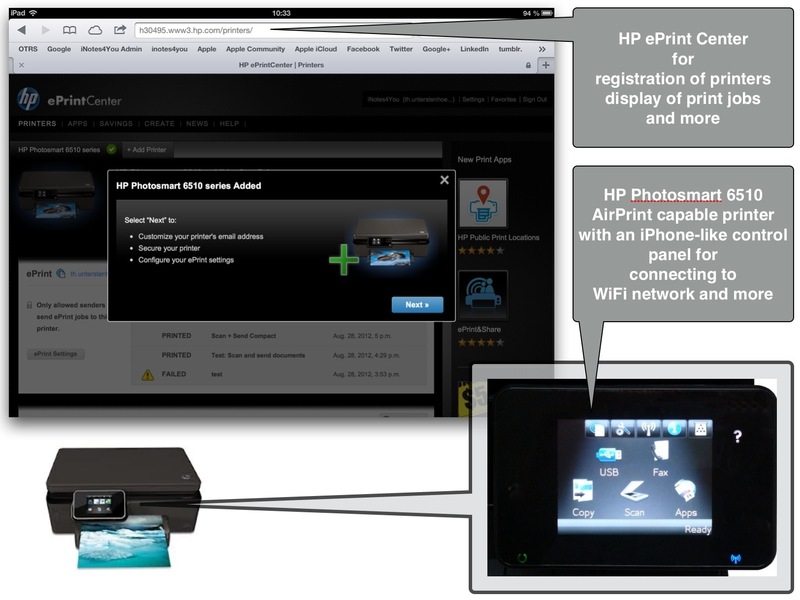 If you are not connected to another WiFi network you even can send a print job to your printer connected to your home or office network by using the HP ePrint Service. Sign in to HP ePrintCenter, register your printer by entering the unique printer code (supplied by HP for every printer; shown in the Web-Service-Menu of the printer’s control panel). You can then create an E-Mail address for your printer. It looks like name@hpeprint.com. If you send a document to this address HP ePrint Service will send a print job to your printer at home or in the office which is assigned to this E-Mail address. You can protect this service by entering E-Mail addresses from which it is allowed to send print jobs. Furthermore Google Cloud Print works together with HP ePrint Service. For example you can print Google docs without waiting for Google’s service to create a printable document. Comments, positive or negative, are appreciated.